6BASE is pleased to present Teto Elsiddique: a distant fire, a solo exhibition on view September 17 through October 29, 2017. Marking the fifth exhibition in the space, this show will include new works made on site by Teto Elsiddique, a 2016 recipient of the Rema Hort Mann Foundation Emerging Artist Grant. Twentieth century visual theory has been haunted by the index—the index not only relates some kind of referential relationship; it suggests a kind of connective tissue through history. Twisting a semiological framework within a more effective and phenomenological one, my work wrestles with the index of past cultural identifiers that have transgressed borders, leaving echoes in our everyday language, gestures, and material existence. Whether in video, sculpture or painting, my work, composited from seemingly unified objects, resonate with traces of a still-trembling past, manifested in the jagged traces of leaves on canvas or in the epoxy shells rigidly molded around familiar items modeled and remade as dimensional casts or flat facsimiles. The object becomes both an offering and a refusal: an offering, insofar as each piece proposes a dialogue with the original; a refusal in its withdrawal from easy diagnosis. The works presented in the exhibition continue to explore a technique used by Elsiddique over the past year. Considered collage assemblage paintings by the artist, these works are created by tracing objects onto loose sheets of plastic, airbrushing the plastic surface, and transferring the image onto canvas. 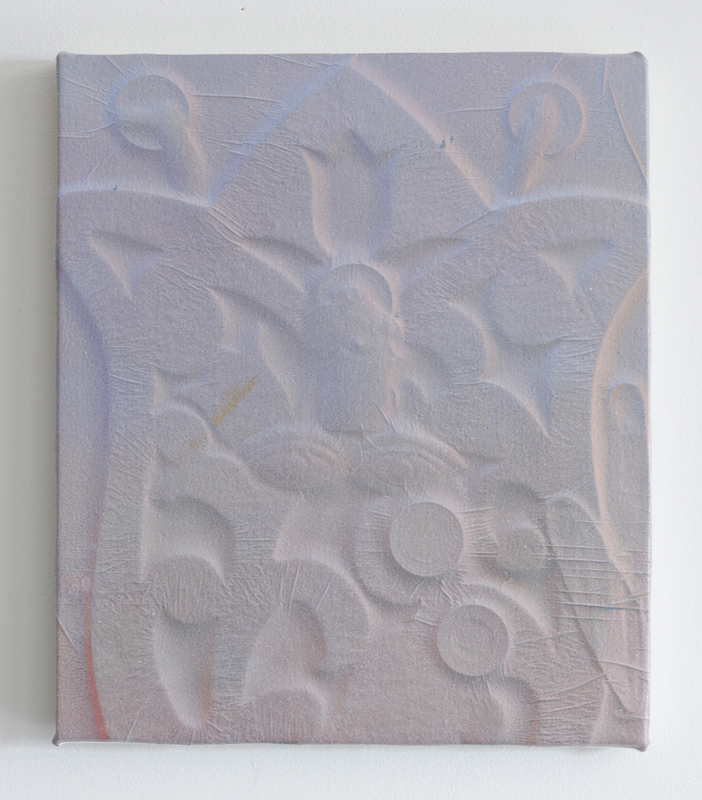 Like a monotype, the compositions are fully developed once the plastic is removed from the canvas. 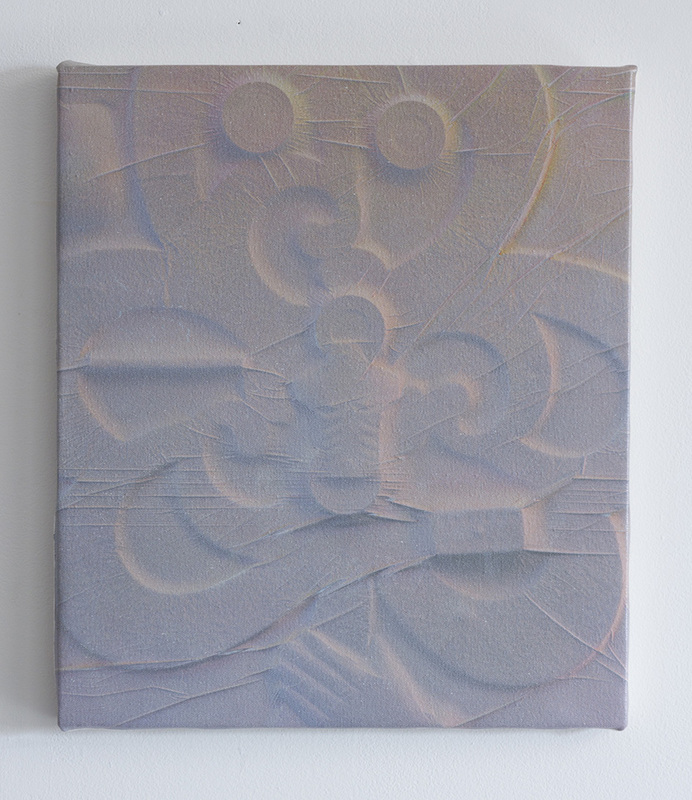 Through this process he is able to capture unique textural qualities in his paintings, brilliantly creating an illusionary effect, which makes the surface appear multidimensional. Here, he newly introduces figures and focuses on the object, which is often connected to Eastern mythology and motifs. Drawing from a collection of Eastern symbols, Elsiddique creates an index of objects, which use formal devices such as anthropomorphism, parody, circulation, and repetition of patterns and forms to subtly hint at and satirize political concepts. At the heart of this work is a playful sense of irony, which is well represented in one painting where in Elsiddique depicts a pair of boots. 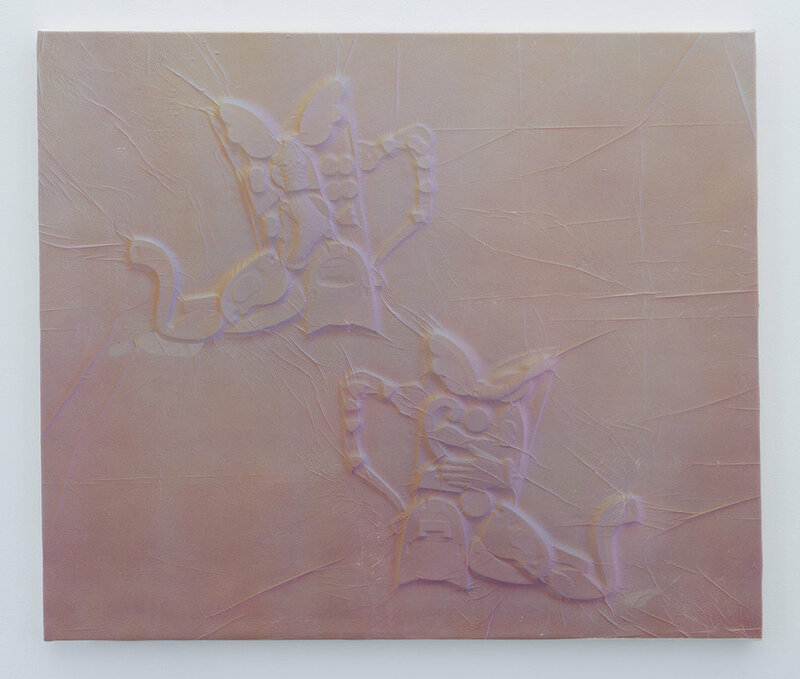 The forms in this work may at first blush appear similar to those worn by the fictional character, Genie, in Disney’s version of Aladdin. Alternatively, the boots could be seen as gushing water spouts. By creating this sense of ambiguity, Elsiddique “invites a peculiar form of engagement” and explores “how culture is generated and passed down, how literary devices translate to visual devices, and how past tropes translate to the present.” With these works, the viewer witnesses the artist at play creating comical mirrors that distort and embellish forms that are recognizable and multi-definitional. Teto Elsiddique was born in Manchester, England, raised in Sudan and Canada, and currently works in the United States. He received his B.F.A. from Nova Scotia College of Art and Design University and his M.F.A from Yale University School of Art, New Haven, Connecticut. Elsiddique’s work was recently the subject of a solo exhibition at Reynolds Gallery, Richmond, Virginia (2017). 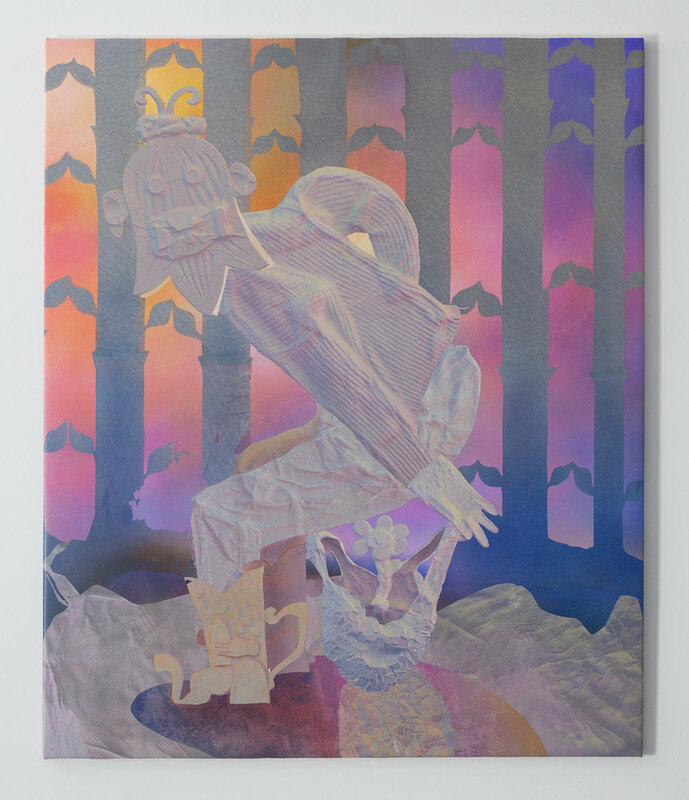 He has participated in numerous group exhibitions including those held at Abrons Arts Center, New York (2016); Green Gallery, New Haven, Connecticut (2016); Montreal Museum of Fine Arts; Weeks Gallery, Jamestown Community College, New York (both 2014) among others. His work is currently on view in a group exhibition at the National Gallery of Canada (through October 22, 2017). The artist was a finalist for this year’s Royal Bank of Canada, Canadian Painting Competition and a recipient of the Rema Hort Mann Foundation Emerging Artist Grant; Ralph Meyer Prize, Yale University School of Art, New Haven, Connecticut (both 2016); Nova Scotia Arts Equity Grant, Haifax (2014; and Chautauqua School of Art Residency Scholarship, New York (2013). In 2016, Elisddique received a Fountainhead Fellowship from the Virginia Commonwealth University where he served as an adjunct in the Painting and Printmaking Department. Sophie Bromberg grew up in Brooklyn and studied dance at Eugene Lang College. She is one half of Loud Relations, a movement duo with Lindsey Weaving. She is currently working with Alexandra Pinel, Liz Charky, and Stormy Budwig. Elizabeth Furman is an aspiring dance theater artist from Brooklyn. After graduating with a B.A. in Dance and English from Kenyon College, Ohio, Furman moved back to Brooklyn where she worked as an administrative assistant at Brooklyn Heights Montessori School. After many years of admiring Monica Bill Barnes & Company from the audience Elizabeth has recently joined their team as Company Assistant. She performs and collaborates with Liz Charky and Molly Mingey Projects sharing work at Chen Dance Center, Dixon place, Movement Research at Judson Church, Triskelion, and Westbeth.